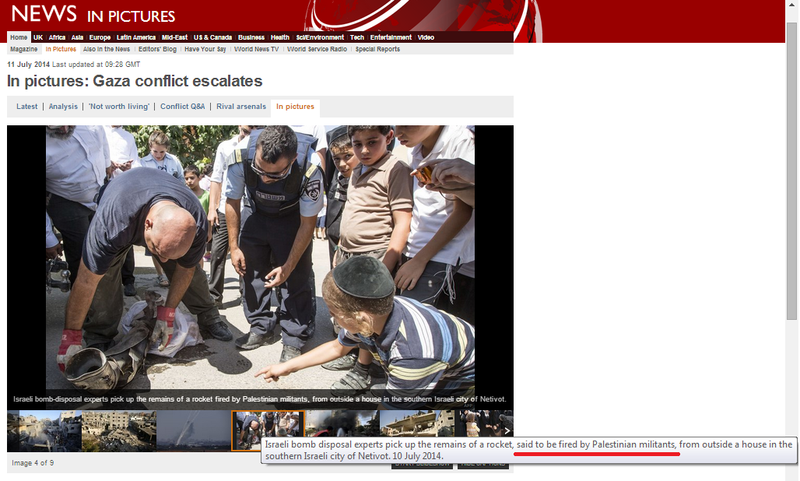 A photo feature titled “Gaza conflict escalates” appeared on the BBC News website’s Middle East page on July 11th. The feature includes nine images: six from the Gaza Strip and three from Israel. Four of the photographs taken in the Gaza Strip show buildings after air-strikes which are described in the captions as “houses” but no context is given regarding the frequent practice of dual-purpose use of such locations as weapons storage facilities and/or command centres for terrorist organisations. Some of the captions also cite Hamas-supplied casualty figures, with no attempt made to distinguish between civilian and combatant casualties. One image shows missiles being launched from a residential area in the Gaza Strip and one shows a group of grieving women at the funeral of members of the Kaware family, but fails to note that those killed were voluntarily acting as human shields. Of the three pictures taken in Israel, there are none of any of the numerous houses damaged by missile fire. One image shows a petrol station in Ashdod which was hit by a missile from the Gaza Strip and two show scenes from the town of Netivot. One of those has the curious caption shown below.